Ladies & gents, damas y caballeros, he’s done it again! Jordan Harvey’s travel planning skills have been praised before, but this week they’ve gotten international recognition as he was named the best travel specialist for Argentina & Chile vacations in Travel + Leisure Magazine. Check newsstands for the October issue and flip to page 94 or read about the Travel + Leisure A-List online. “I almost fainted right there in the Dallas/Ft. Worth customs after landing from Chile,” Jordan says of finding out. “We work really hard and have unparalleled levels of knowledge and operating capabilities in our regions, but we focus much more on the experience and staying on the cutting edge in our destinations than we do on getting press and winning contests, so this came as a huge shock. Not to mention we’re probably the newest and smallest company on the list,” he added. We at Knowmad couldn’t be more proud. The Travel & Leisure A-List is a comprehensive list of the world’s top travel specialists. Published annually, their 12th annual A-List of Top Travel Specialists Worldwide is a coveted honor reserved for the most knowledgeable and innovative specialists. Jordan is one of a handful of newcomers, and is being recognized as a Top Travel Specialist for Argentina & Chile, as well as a special mention for Peru. We believe what set Jordan apart was Knowmad’s philosophy for travel. Born of the idea that travel is a unique expression of independence, liberation, and curiosity, Knowmad works with independent-minded travelers looking for unique and authentic journeys that are exceptionally well planned. We take out the stress, not the adventure. Our extensive on-the-ground research and exploration of our destinations has made us leaders in custom and private travel in South America. Jordan and his wife Tara started Knowmad in 2009, flying south to Chile as newlyweds to embark on what they now know to be the journey of a lifetime. They first rented a cabin on a dairy farm outside of Puerto Varas to further access the Lakes District & Northern Patagonia regions of Chile. 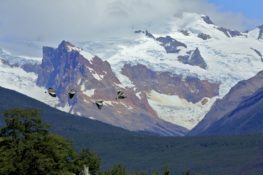 Family and friends traveled far to try their first hand-crafted itinerary, the Northern Patagonia Odyssey and deemed it a wild success. Four years later, after a move back to the U.S. (they are now based in Minneapolis, Minnesota), countless trips back down to South America, and about 500 happy returning travelers, Knowmad now operates trips in Peru & Machu Picchu, as well as Chile & Argentina, and recently debuted all new Ecuador & Galapagos vacations on the completely redesigned website www.KnowmadAdventures.com. We continue to work hard building trips for travelers, not tourists and can’t thank T + L enough for the recognition. Maybe an adventure to South America is on your dream trips list? Give Jordan a call at 612-877-1735 and test his knowledge!